Organization of the 133rd Company, Civilian Conservation Corp (CCC), took place at Fort Williams, Maine, May 3, 1933, under the command of C.O. Ashton, 5th Infantry. On May 19, 1933 the company was moved by rail to the Gale River Experimental Forest, Bethlehem, N.H. where it remained a tent camp until September 25, 1933. 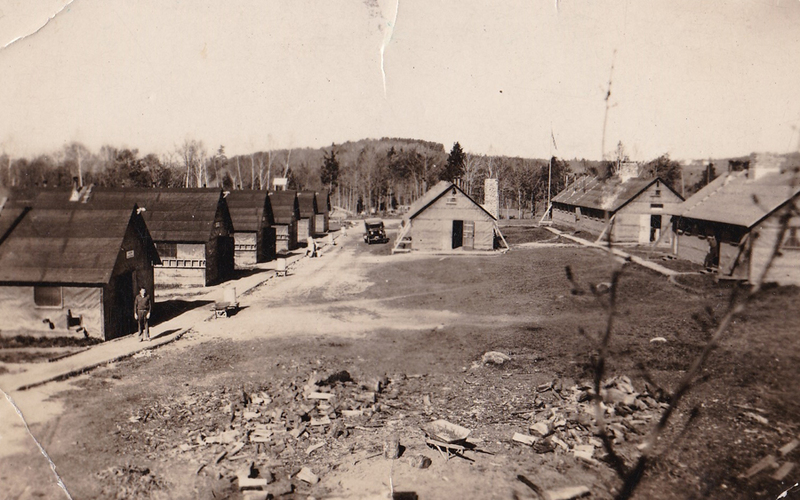 Upon completion of permanent barracks, the company was moved to its permanent location at Gale River Camp No. 2118, 3-NH-NF, at Pierce Bridge, N.H. In 1933 and 1934,the major portion of camp work consisted of the construction of approximately 12-mile of truck trail road throughout the Experimental Forest. These roads opened up several thousand acres of forestland to more intensive experimental research and in addition made possible adequate fire protection for the whole area. Drainage of 500 acres of swamp land in the Experimental Forest was a big project engaged upon. Ditches were speedily made by the use of dynamite and by the end of the summer of 1934 the whole area was being drained into the Gale River by a series of interlacing dikes. Many of the men who worked on the project became proficient in the use and handling of dynamite. The camps largest project, the construction of steel and concrete bridges over the Ammonoosuc and Zealand Rivers was begun during the summer of 1934. From the moving of the first rock in the stream beds through the sinking of coffer dams, construction of wooden forms, hauling of sand and gravel from nearby pits, to the final polishing of the concrete hand-rails, Gale River’s CCC slowly saw their bridges take shape. Early in 1935, their task was completed and even the floods of 1936 were unable to weaken them. While part of the camp force engaged in building the two bridges, the remainder stayed busy constructing a truck trail connecting both bridges and continuing on into Zealand Valley proper. This road, 18 feet in width was a hard gravel surface, now extends two and one-half miles into the valley. The chief advantage of the road so far is the fire protection afforded a region, which, in the past had been ravaged by fire on more than one occasion. A bit of excitement which provided material for several nights discussion happened in the winter of 1934. The camp work project at the time was largely girdling in the mountainous Zealand valley area. One of the girdlers had just started to girdle a tree when suddenly his snowshoes were shot out from beneath him. A large black bear disturbed by the axe blows had risen directly under the youth. Gaining his feet, the boy swung his axe hard and succeeded in wounding the animal. One more blow and the danger was over. In the meantime, a small bear cub which had been asleep with its parent was captured by other CCC workers who had come to the rescue.The cub was brought to camp and kept as a mascot for several months. A fine bear rug now decorates the Officer’s recreation hall as a reminder of the incident. In 1935, Gale River’s enrollees built the Jewel trail up Mt. Washington. This trail, two and a half miles long, starts at the Base station and finally joins the Taft trail above the tree line. Visitors who enjoy hiking in the White Mountains during the summer season call it one of the best trails up the mountain. Enlarging and development of the Zealand and Gale River public campgrounds, was undertaken in 1936. By the fall, both campgrounds had been completely improved; shelters, toilets, fireplaces, parking areas and rustic furniture are a few of the new features added to these camping areas. Today, both campgrounds are among the most popular in the White Mountains. During the winter of 1936 and 1935, a high country log cabin was built on Mt. Kinsman, Franconia, N.H. This cabin, 28 feet by 20 feet, was built of logs, every one of which was hand hewn and filleted. Accommodations are provided for six people. Camp enrollees also made a Timber Survey of forest land in the White Mountain District and state forest land in Coos County. Several thousand acres were surveyed and it took many months to complete. Other projects done by the camp included maintenance of roads, repair and maintenance of many mountain trails, timber stand improvement of several thousand acres of forest land in the White Mountain District and maintenance of the Mt. Hale fire tower.